The boyfriend’s Mum, Solveig, is an awesome cook. She makes gorgeous souffles, the world’s best mushroom pate, amazing breads, and generally delicious food. 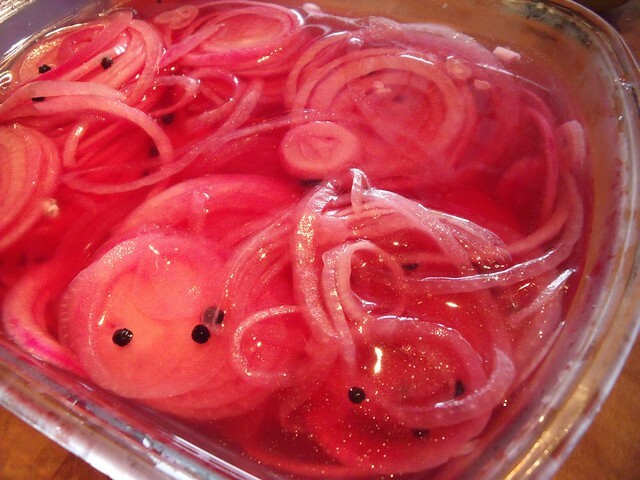 I was over at her place when she had made a batch of pickled red onions, and she offered me some to take home. OH HEAVENS, are they delicious. As soon as I’d tasted them, I knew I had to make my own batch, so I asked for the recipe. And great news, they are from a cookbook I own: Molly Katzen’s Moosewood Cookbook. But I was first introduced to these onions as made by Solveig, so they will forever more be Solveig’s Pickled Onions. Each batch makes about 4 cups of pickled onions. Molly Katzen says they “keep practically indefinitely” in the fridge, but I don’t think a batch will last you that long. We use them by the cupful for a main-course salad for 2 people, or side salads for 4 people. So we go through them in about a week. And they’re great atop of grain dishes (like quinoa!). In fact, I actually can’t picture a vinegary salad without them at this point. Stay tuned for my favourite vegan arugula salad that highlights them perfectly, mmmm. Boil a teakettle full of water. Combine vinegar, water, sugar, salt & peppercorns to create your marinade. Stir until the sugar is dissolved. Place the onion slices in a colander in the sink, and pour the boiling water slowly over the onion slices, which will make them melt slightly. Let the onions drain well. Transfer the onions to the marinade and let marinate for 4 hours or more. Keep in the fridge “practically indefinitely”. Glad you clarified the keeping time – I would care to bet that even that 4 hour marinating time would be tough to enforce… Seriously, pickled ANYTHING goes down well for me! Do you think there could ever be a probiotic element if you fermented these (like sauerkraut?). That would be super cool. 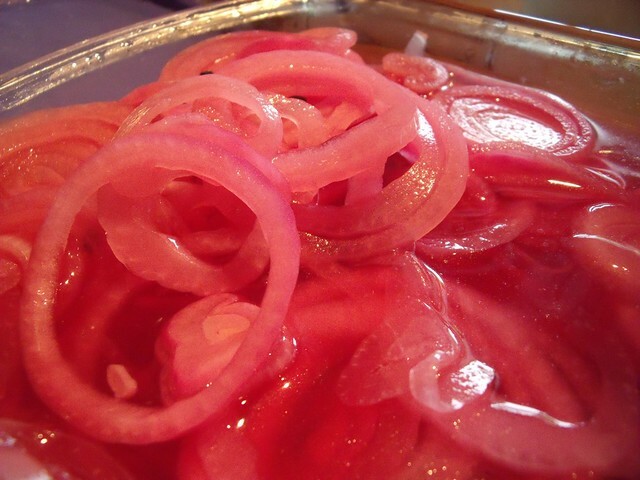 Pickled red onions are so delicious and so easy! The best condiment eva! Love the Moosewood cookbooks….somehow never managed to eat there thought when I was living in Rochester…Ithaca was so close but so far away when you didn’t have a car! Moosewood was the 1st veg cook book that I owned! I have no idea where it is now though.